Illustration showing the humanist Johann Reuchlin (kneeling) and wringing his hands while Pfefferkorn stands by him in a master's robes. 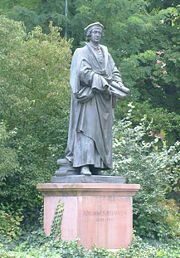 Johannes Pfefferkorn (1469 – 1523) was a German-Jewish convert to Catholicism who became a famous anti-Jewish polemicist. After associating himself with the Dominicans in the early 1500s, Pfefferkorn condemned Jewish religious tradition as intolerably anti-Christian. He attempted to have copies of the Talmud confiscated or destroyed, urged that Jews be forced to attend Christian sermons, and eventually recommended that they be expelled from Christian lands if they did not convert. Pfefferkorn succeeded temporarily in influencing Emperor Maximilian I to authorize the confiscation of the Talmud and other Jewish works in several major German cities under Pfefferkorn's supervision. However, protests from more liberal-minded Catholics soon caused the opening of a broader investigation. Pfefferkorn's leading opponent in the dispute that followed was the German humanist Johann Reuchlin. A long-running and bitter public feud ensued, which became a major controversy in the most prominent German universities. After reading Reuchlin's defense of the Jews, the emperor decided to rescind his decree against Jewish literature, but Reuchlin found himself in trouble with the Dominicans, who were in charge of the Inquisition. Pope Leo X ultimately condemned Reuchlin's views, and Pfefferkorn declared himself victorious, although the emperor did not adopt Pfefferkorn's recommendations. Pfefferkorn's name has become practically synonymous with treason in the Jewish community. He is remembered to general history mainly as a preacher of intolerance just as a new age of liberal learning was dawning. Pfefferkorn argued that the Talmud was essentially anti-Christian and urged its confiscation or destruction. Pfefferkorn soon became an assistant to Jacob van Hoogstraaten, the prior of the Dominican monastery at Cologne who saw in Pfefferkorn a useful tool to increase Dominican influence as the guardians of the Christian faith in Germany. As Pfefferkorn showed talent as a writer, Hoogstraaten helped him to publish several pamphlets alleging that Jewish religious writings such as the Talmud and later rabbinical works were insultingly hostile to Christianity. The tone of his writings and the anti-Jewish policies he espoused became increasingly extreme with time, as he encountered bitter opposition from his former co-religionists. In Der Judenspiegel (The Jew Book, 1507), he already demanded that the Jews be required to give up the practice of lending at interest, attend Christian sermons, and do away with the books of the Talmud. "The causes which hinder the Jews from becoming Christians," he wrote, "are three: First, usury; second, because they are not compelled to attend Christian churches to hear the sermons; and third, because they honor the Talmud." On the other hand, he condemned the outright persecution of the Jews as an obstacle to their conversion, and in Warnungsspiegel (Warning Book) he defended the Jews against charges of murdering Christian children for ritual purposes. Here he portrayed himself as a friend of the Jews who desired to introduce Christianity among them for their own good. However, he also advocated seizing the Talmud by force. Bitterly opposed by the Jews on account of these works, he virulently counter-attacked in Wie die blinden Jüden ihr Ostern halten (How the Blind Jews Celebrate Their Easter, 1508), Judenbeicht (Confession of a Jew), and Judenfeind (Enemy of the Jew, 1509). In Judenfeind, he reversed himself and insisted that every Jew considers it a good deed to kill, or at least to mock, a Christian. He reiterated his demand that Jewish books be confiscated: "It is the duty of the people to ask permission of the rulers to take from the Jews all their books except the Bible," he declared. He also deemed it the duty of all true Christians to expel the Jews from all Christian lands. If the law should forbid such a deed, he claimed, Christians do not need to obey it. He even went so far as to preach that Jewish children should be taken from their parents and educated as Catholics. In conclusion he wrote: "Who afflicts the Jews is doing the will of God, and who seeks their benefit will incur damnation." Pfefferkorn did not limit his campaign against the Jews to writing. He obtained recommendations from several Dominican establishments addressed to Kunigunde, the sister of the Emperor Maximilian, and through her influence, to the emperor himself. 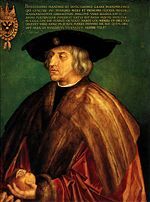 On August 19, 1509, Maximillian, who already had expelled the Jews from his own domains of Styria, Carinthia, and Carniola, ordered the Jews of Germany to deliver to Pfefferkorn all books opposing Christianity or else to destroy any Hebrew book except the Old Testament. Pfefferkorn began the work of confiscation at either Frankfort-on-the-Main or Magdeburg and then proceeded to Worms, Mainz, Bingen, Lorch, Lahnstein, and Deutz. However, through the help of the elector and archbishop of Mainz, Uriel von Gemmingen, the Jews asked the emperor to appoint a commission to investigate Pfefferkorn's accusations. Pfefferkorn, it seemed, was by no means a Talmudic scholar and had quoted the sections of the Talmud that favored his views without due consideration of the historical development of the Talmudic tradition and the often conflicting opinions expressed in the text by various rabbinical authorities. A new imperial mandate of November 10, 1509, gave the direction of the whole affair to the archbishop, with orders to secure opinions from the universities of Mainz, Cologne, Erfurt, and Heidelberg, as well as from the inquisitor Jakob Hochstraten of Cologne, from the priest Victor von Carben, and from the humanist scholar and expert in Hebrew literature, Johann Reuchlin. To justify his views, Pfefferkorn now wrote, In Lob und Eer dem allerdurchleuchtigsten grossmechtigsten Fürsten und Herrn Maximilian (In Praise and Honor of the Most Illuminated, Most Powerful Prince and Lord Maximillian). In April, 1510, he was again at Frankfort, where he undertook a new confiscation of Jewish books. In October 1510, the inquisitor Hochstraten and the Christian scholars of the universities of Mainz and Cologne issued their opinion in favor of Pfefferkorn's allegation that the Talmud and other Jewish works deserved to be taken from the Jews. Reuchlin, on the other hand, declared that only those few sections of the Talmud which were specifically and virulently anti-Christian should be banned. Besides the Hebrew Bible itself, he divided Jewish literature into six classes, demonstrating that those openly insulting to Christianity were very few and were viewed as worthless by most Jews themselves. He showed the others to be either works necessary to Jewish worship—which were licensed by both papal and imperial law—or contained matter of historical and scholarly value which ought not to be sacrificed. 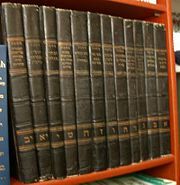 Rather than confiscating the books of the Talmud, as well as the Zohar, the commentaries of Rashi, and the works of later rabbinical sages, he proposed that the emperor should decree that there be two Hebrew chairs at every German university, for which the Jews should furnish books. The elector-archbishop sent all the answers received at the end of October, and on May 23, 1510, the emperor suspended his edict of 1509. The confiscated books were returned to the Jews. Informed of Johann Reuchlin's influential treatise in favor of the Jews, Pfefferkorn answered with Handspiegel (Handbook, 1511), in which he attacked Reuchlin personally. Reuchlin complained to Emperor Maximilian and also answered Pfefferkorn's attack with his Augenspiegel ("Ophthalmoscope"), against which Pfefferkorn published his Brandspiegel (Fire Book). In June 1513, both parties were ordered to silence by the emperor. 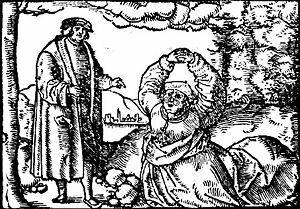 In 1514, however, Pfefferkorn published a new polemic, Sturmglock (Alarm Bell), against both the Jews and Reuchlin. The issue had now become emblematic of the ideological struggle between the Dominicans and the humanists. The Dominican inquisitor Hochstraten began an investigation against Reuchlin's views in 1513. Reuchlin appealed to Pope Leo X, and the controversy became an issue at the major German universities. A group of young humanists who espoused Reuchlin's cause assailed Pfefferkorn, as well as the Dominican version of late scholasticism, in the satirical Epistolæ obscurorum virorum (Letters of the Obscure Men). The Lateran Council, at its session of 1516, decided in favor of Reuchlin, but this verdict was set aside. Meanwhile, and Pfefferkorn replied against the Obscure Men with Beschirmung (1516) and Streitbüchlein (1517). The controversy then lost steam as public attention shifted to Martin Luther's clash with the pope over the selling of indulgences and the reformation of the Roman Catholic Church. However, in 1520, Pope Leo X condemned the views which Reuchlin had expressed in Augenspiegel, and Pfefferkorn wrote an expression of his triumph Ein mitleidliche Klag (A Pitiful Lamentation, 1521). After this, nothing more is heard of Pfefferkorn or his career as an instrument of the Dominicans. The order had won its larger fight against Reuchlin, but the emperor's edict against the Jews was not revived. Among the Jews, the name of Pfefferkorn lives in infamy, not only as an infamous Jewish convert to Christianity, but as one who supported the harshest of policies against the Jews and their religion. He was not the first to use the Jews' own writings against them, he would by no means be the last, as many later anti-Jewish writers would take up his arguments against the Jews by quoting selectively from the Talmud. Today he is remembered primarily as an opportunistic preacher of intolerance, while his opponent, Reuchlin, is remembered as a man of foresight and moral courage. B'nai B'rith. The Talmud in Anti-Semitic Polemics. New York: Anti-defamation League, 2003. OCLC 54009010. Cohen, Jeremy. Essential Papers on Judaism and Christianity in Conflict: From Late Antiquity to the Reformation. New York: New York University Press, 1991. ISBN 9780814714430. —. The Friars and the Jews: The Evolution of Medieval Anti-Judaism. Ithaca: Cornell University Press, 1982. ISBN 9780801414060. Michael, Robert. A History of Catholic Antisemitism: The Dark Side of the Church. New York: Palgrave Macmillan, 2008. ISBN 9780230603882. Reuchlin, Johann. Recommendation Whether to Confiscate, Destroy, and Burn All Jewish Books: A Classic Treatise against Anti-Semitism. Stimulus series. New York: Paulist Press, 2000. ISBN 9780809139729. Rummel, Erika. The Case against Johann Reuchlin: Religious and Social Controversy in Sixteenth-Century Germany. Toronto, Ont: University of Toronto Press, 2002. ISBN 9780802084842. This page was last modified on 25 August 2008, at 21:08.